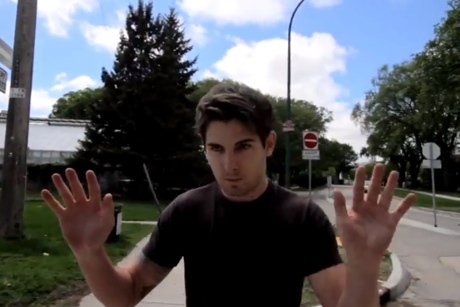 Winnipeg punks Clipwing began a story with their video for "What I'm with Isn't It." Now, that two-video story arc has concluded with a clip for the gritty "Iowa." The prior video introduced us to a man's pusuit of the "girl next door," as he made his way through the city in pursuit of his lady love. In this sequel, our skateboarding protagonist continues his journey despite being hit by a car and getting chased with his skate deck. In a classic music video trope, the couple end up meeting at the Clipwing show, but not all goes as played for the leading man. This song come from the band's split with Icons Down!